Emergency medicine services and training in Emergency Medicine (EM) has developed to a large extent in developed countries but its establishment is far from optimal in developing countries. In India, Medical Council of India (MCI) has taken great steps by notifying EM as a separate specialty and so far 20 medical colleges have already initiated 3-year training program in EM. However, there has been shortage of trained faculty, and ambiguity regarding curriculum, rotation policy, infrastructure, teachers' eligibility qualifications and scheme of examination. Academic College of Emergency Experts in India (ACEE-India) has been a powerful advocate for developing Academic EM in India. The ACEE's Education Development Committee (EDC) was created to chalk out guidelines for staffing, infrastructure, resources, curriculum, and training which may be of help to the MCI and the National Board of Examinations (NBE) to set standards for starting 3-year training program in EM and develop the departments of EM as centers of quality education, research, and treatment across India. This paper has made an attempt to give recommendations so as to provide a uniform framework to the institutions, thus guiding them towards establishing an academic Department of EM for starting the 3-year training program in the specialty of EM. In the twenty first century, non-communicable diseases (NCDs) are rapidly growing and adding to the existing burden of communicable diseases. The health care system needs to reorganize in order to handle the rise in non-communicable illnesses and trauma. Urbanization, better access to health care, improved medical treatment of infectious diseases, and health awareness has led to longer life spans; while changes in diet patterns, decreased physical activity and increased tobacco use predispose this population to development of coronary atherosclerosis. Current statistics indicate that in developing countries like India, cardiac diseases and stroke will be a major cause of death and disability in 2020. Adding to the burden of cardiac diseases is a growing problem from road traffic accidents. These factors have contributed to the disease transition in developing countries from communicable diseases to long-term chronic health problems and acute trauma. ,, Even though the epidemic is in its very early stages, it is projected to emerge as a major threat to the developing nations. Despite having academic departments of EM in a few colleges, the training of residents and the qualifications of teachers remain a big question mark. Unfortunately, lack of clarity about the core curriculum, training modules, and qualifications of teachers has led to mushrooming of short term diplomas and 3-year courses in EM offered by corporate hospitals in collaboration with some foreign universities. This may lead to early attrition of newly created academic departments of EM in some of the medical institutions. In order to promote the specialty of EM, particularly teaching and training of both post graduates and faculty in EM, an INDO-US Emergency and Trauma Collaborative was established in 2007. This collaboration led to the creation of the Academic College of Emergency Experts (ACEE) in India. The main focus of the College is to impart training to faculty from different disciplines in the field of EM so that they in turn can teach and train post graduates of departments of EM. Since creation of workforce in the specialty of EM will take several years, ACEE also endeavors to teach and train doctors who are working in EM so that patients attending emergency room can get quality emergency care. The ACEE-India has gone into problems faced by existing departments and has tried to address the issues regarding core curriculum, teachers' eligibility qualifications, requirement of staff, rotations of residents, and infrastructure requirement of EDs. Currently, there are no uniform guidelines in these areas. The ACEE-India constituted an Education Development Committee (EDC) to chalk out guidelines on the above issues. This paper has made an attempt to give recommendations to address these issues so as to provide a uniform framework to the institutions, thus guiding them towards establishing an academic department of EM. These guidelines would provide requisite resources for our policy makers such as MCI and National Board of Examinations (NBE) for setting uniform standards for creation of academic departments of EM. As per the existing MCI Regulations on Minimum Standard Requirements for MBBS Course in various medical institutions, there is no provision for essential requirement of department of EM. It has been observed that the current training program for undergraduates does not involve much of the training in acquisition of various skills in the setting of EM. Further, most of the hospitals are overburdened with large number of patients suffering from various emergency disorders related to one or the other department. Under such circumstances, for the initial few critical hours, there is paucity of ownership of these critically ill patients. These patients require maximum care by experts from various specialities; however the ground reality in most of the emergency rooms is that these patients are attended by the least qualified personnel. Very often because of lack of clarity about the final diagnosis during the first few hours of visit to the emergency room or due to conditions such as trauma and sepsis involving multiple organ systems, the patient is shuttled from one department to the other. Since there is no ownership of the emergency section, maintenance of life-saving equipment is also often adversely affected. The MCI has made it mandatory for all medical institutions to have separate departments even for minor specialities such as Dentistry, Psychiatry, etc; however establishment of department of EM has always taken a back seat. Further since MCI has recently notified 3-year post graduate (MD) course in EM and a few medical colleges have already started this course, inclusion of the requirement to establish the department of EM as a minimum standard requirement for MBBS course shall go a long way in strengthening the emergency care in addition to creation of a nucleus for growth of the speciality of EM in India. This may be accomplished in a phased manner over the next 3 years. Clause 11.3 of Postgraduate Medical Education Regulations, 2000 of MCI mentions that "A Department to be recognized for training of Post Graduate students, shall have at least 60 (sixty) beds each of general medicine, general surgery, obstetrics and gynecology, and 30 (thirty) beds each for others in case of M.D./M.S. and Diploma courses, and 20 (twenty) beds each in case of D.M./M.Ch." The ACEE-India proposes that for starting a Department of EM, the hospital should have at least 20 beds exclusively earmarked for EM where initial resuscitation and observation of patients with all types of emergencies can be carried out. Of these 20 beds, at least six beds should be Intensive Care Unit (ICU)/High-Dependency Unit (HDU) beds where immediate resuscitation and stabilization of the patients can be carried out. Other beds should be for observation and management of patients. In addition, facilities for triaging patients should be available. These 20 beds (including 6 beds of ICU/HDU) should specifically be used for observation and management of patients by the emergency physicians and not for admission of patients. The bed occupancy rate of the emergency department should be at least 75%. Minimum number of admissions through ED should be 20 per day before a department is considered eligible for starting MD course in EM. As per MCI Regulations, the minimum requirement of teachers for broad specialties or superspecialties shall be three full time faculty members belonging to the concerned disciplines of whom one shall be a Professor, one Associate Professor/Reader, and one Assistant Professor/Lecturer possessing requisite qualification and teaching experience prescribed by the MCI. Since EM is not a well-established specialty in India and only a few colleges have this specialty, it may not be possible to get EM-qualified person for the faculty job during the initial few years. As per the MCI Regulations, for the Teachers Eligibility Qualifications in the department of EM, basic qualification should be MD/MS (or equivalent) in EM, general medicine, general surgery, anesthesia, orthopedics, or pulmonary medicine. Therefore, the faculty from other departments who are interested in EM may be asked to shift full time and permanently to EM and should not be shifted back to the parent department. This arrangement of selection from other specialties should continue till adequate EM-trained physicians become available in India. MCI has made provision for this for the next 10 years. The teachers' eligibility criteria may be reviewed after 10 years of existence of EM. Such selection should be based on open competition where faculty from other hospitals can also be considered for these posts. In the current MCI Regulations, there is a need for 2-years training in EM before one can be considered for teaching posts in the department of EM; however since EM is not a well-established specialty in India, it may not be possible to get teachers having specific experience in the field of EM, especially at Professor and Associate Professor levels during the initial few years. The ACEE-India therefore proposes that the requirement of 2-year training in EM may be deleted; however, the teachers must fulfil the requirement of length of teaching experience in the parent specialty as specified by the MCI for the posts of Professor and Associate Professor/Reader respectively. During selection procedure of faculty, the ACEE-India is of strong view that physicians with training in EM like Fellowship of Academic College of Emergency Experts in India (FACEE) should be given preference as this fellowship is given after 1-year long program in which the physician has to become well versed with the whole body of knowledge of EM as well as acquire skills in various procedures. This fellowship can be achieved while one a working in his own discipline. If teachers qualified in EM are not available, it should be ensured that at least one teacher should be from the specialty of General Medicine and the other one from the specialty of General Surgery. The third teacher can be from any one of the remaining specialties already approved by the MCI viz. Anesthesia, Pulmonary Medicine, or Orthopedics. The posts should be widely advertised so that the department has faculty from different specialties and not from a single or two specialties. It has been observed that in many departments currently running MD course in EM, the existing teachers continue to work in their parent departments or in the Critical Care Units (CCUs) of the hospital, thus compromising the teaching facilities and patient care in the Department of EM. ACEE-India strongly feels that MCI must ensure that various medical institutions running MD course in EM must abstain from this practice and ensure that the teachers appointed in the Department of EM must be available on full time basis and should not be involved in the teaching/patient care activities of the parent departments. In view of critically ill patients attending the ED and high turnover of patients, adequate number of nurses, paramedics, laboratory technicians, and house-keeping staff as per ICU/HDU and emergency ward norms should be available. In the hospital, at least 15 major and 15 minor surgeries should be performed per week in the emergency operation theatres (EOT). The hospital should have at least six ICU beds in anesthesia department; in addition, the Department of EM should have a separate ICU/HDU area with six beds where patients can be resuscitated and monitored before admission. An attached minor operation theatre (MOT) should be available for minor surgeries. Department of EM should have separate areas for examining Obstetrics and Gynecology patients, medico-legal work, triage, and registration. All the ICU/HDU beds in department of EM should have central oxygen and suction facility, bedside vital sign monitors (one per bed), ventilators (one per two beds), infusion pumps (two per bed), defibrillator with external pacer (one), and nebulizers (one per three beds). Other beds should also have central oxygen and suction facility, bedside vital sign monitors (one per seven beds), ventilators (one per seven beds), infusion pumps (two per seven beds) and nebulizers (one per seven beds). In addition, the department should have one portable ultrasound and echocardiography machine dedicated to EM. The hospital should have in-house computed tomography (CT) scan with at least 10 scans performed per day. Department of EM should have a point-of-care (POC) laboratory for quantitative tests [arterial blood gas (ABG), serum electrolytes, cardiac enzymes, etc]. Facilities for analysis of body fluids and cultures should be available in the hospital round-the-clock. 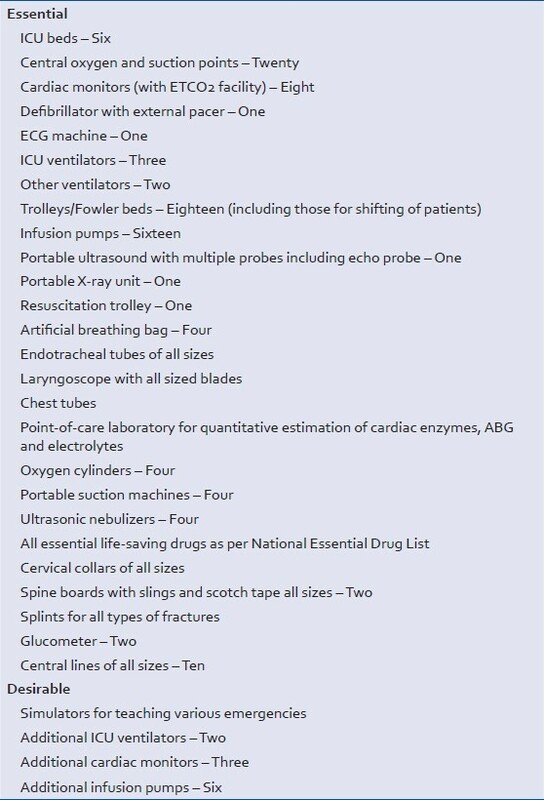 List of equipment which should be available in the Department of EM is given in [Table 1]. Excellent simulators and mannequins should be available for training. Availability of Skills Laboratory for training is not mandated at present; however ACEE-India emphasizes its requirement for Department of EM. Establishment of Skills Laboratory should entitle the institution for higher gradation in accreditation. [Table 2] gives a list of desired books and journals before a Department of EM is established. MCI appoints Assessors for evaluation of medical institutions before granting permission for starting new courses, increase of seats and recognition of postgraduate degree courses in various disciplines. For assessment of department of EM, MCI Assessors should be appointed only from amongst the MCI-recognized Professors/Additional Professors working in Departments of EM in various medical colleges which are running the MCI-recognized Post Graduate degree course in EM. At present, the postgraduates of EM do not have any defined core curriculum approved by the MCI. Due to lack of any core curriculum, teaching and training of postgraduates of EM may be inadequate, and at times, irrelevant. ACEE-India has drafted a core curriculum for training of postgraduates of EM [Table 3]. The curriculum is designed to facilitate learning across all age-groups and acquire core competencies in various clinical scenarios including those in pregnancy and during mass casualty events. The curriculum has given emphasis to emergencies which are more common or have different presentations in our country as compared to western countries. For example, section on toxicology deals with pesticide poisoning and snake bites. The candidate should be able to perform several emergency skills independently both in adults and children. [Table 4] gives core competencies which must be acquired by the postgraduates during the 3-year training in ED as well as during rotation to various departments. In addition, a postgraduate has to perform many of the emergency procedures himself and should gain full proficiency in performing them. 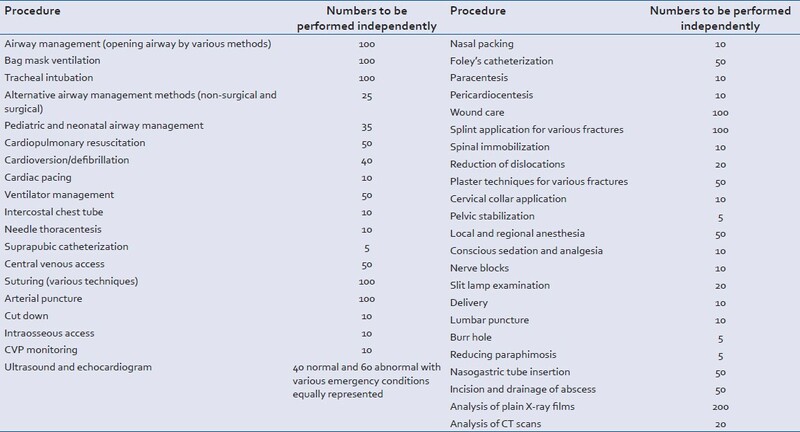 During the training program, a postgraduate must perform a minimum number of each procedure before he can be allowed to appear for the final practical examinations [Table 5]. The details of all the procedures performed by the postgraduate must be recorded in a log book which should be duly verified by the teacher. In order to promote research capabilities and scientific paper writing, all postgraduates of EM shall be required to work on a research topic and submit a thesis at least 6 months before the final examination. The thesis protocol should be submitted and accepted by the appropriate authority within first 6 months of joining the postgraduate course in EM. Thesis topics must be relevant to diagnosis and management of patients presenting to an ED. This may also include topics related to basic sciences but relevant to conditions seen in ED so that outcome of patients can be improved through translational research. This section includes a comprehensive list of goals for residents rotating through various departments/areas [Table 6]. The proposed duration of rotation is also mentioned. The students are expected to learn all procedural skills required and related to every rotation. During first one month in the ED, the student should be given orientation as regards the administrative set up, communication skills and working of the ED along with training on research methodology. In medical institutions having superspeciality departments, the students should be uniformly rotated through various super specialties namely Cardiology, Neurology, Nephrology, Trauma Surgery, Neurosurgery, etc. for minimum of 2 weeks each. The duration of training in the above mentioned superspecialties shall be deducted out of the training period allocated for the allied broad specialties viz. General Medicine/General Surgery respectively. At the end of rotation to various departments, internal assessment should be taken by that particular department. This should be based on the clinical skills acquired during the posting. Logbook: To be evaluated periodically and checked by the faculty of the concerned department. At the end of three years, the MD final examination should have both theory and practical components. The candidate must pass theory as well as practical examinations separately and the minimum criteria for passing should be 50% marks in theory and practical examination separately. Internal assessment and log book should constitute about 25% of total marks in the final examination. As in other specialties, final examination for postgraduates in EM should also have four examiners (two internal and two external). Internal examiners should be only those teachers who are working exclusively in the Department of EM. The Convener for the examination should not be below the rank of a Professor while the second examiner should not be below the rank of Associate Professor/Reader. External examiners should be appointed as per the MCI norms. Both the external examiners should not be below the rank of Professor/Additional Professor and should be only from the Departments of EM of various medical colleges running MCI-recognized postgraduate degree course in EM. As with other specialties, the final examination should have four question papers (3 hours each) as given below in [Table 7]. The theory papers should be based on short questions-answers pattern. The examiners must set only those questions which are relevant to the specialty of EM. Each paper may have 20 questions of five marks each; all questions should be compulsory. Short cases: Assessment should be based only on short cases. At least 10 cases should be given to each postgraduate student with distribution of cases as follows: two from medicine, one from surgery, one from trauma, one from pediatrics, and one each from dermatology, psychiatry, ophthalmology (trauma/fundus), ENT (ear, nose or throat acute problem) and obstetrics and gynecology. Spotting: Twenty spotters should be given and these should include X-rays, ECG, CT/MRI imaging, instruments, blood gas and acid-base reports, ultrasound, clinical photographs. Objective Structured Clinical Examination (OSCE): Two cases (one single and one multiple patient encounters) should be given to test the candidates. Viva voce: Only questions relevant to EM should be asked in viva voce. ACEE-India recommends that every medical student should be posted in the Department of EM as a part of his/her clinical rotation. The rotation in EM should be for one month followed by assessment. The student should do clinical shifts in the EM department during this rotation. He/she should attend all academic activities of the department, namely journal club, clinical presentations, seminars, etc. held in the department. It is recommended that the medical students learn in detail all fundamentals of resuscitation and also do various procedures in the ED under supervision of teachers and/or senior residents. A log book needs to be maintained where in the student should record all activities he or she has done during the rotation in EM. Topics to be covered during the rotation are mentioned in [Table 8]. During the internship period, 2 weeks posting in Casualty may be replaced by 1 month posting in EM; accordingly a period of 2 weeks posting may be reduced in other departments. It has been noted that MCI has recently given permission for a 3-year postgraduate degree course (MS) in Trauma and Surgery. It may create confusion and conflict with the broad specialty training programs in orthopedics and general surgery. As per the existing world-wide practice, the academic programs in orthopedic trauma and surgical trauma are two separate superspecialties at post-doctoral level. It would be very difficult for a person to be trained both in the fields of orthopedic trauma as well as surgical trauma, as these are two different fields. Therefore, it would be appropriate that instead of having the broad specialty of MS in trauma and surgery, we should have superspecialties/fellowships in orthopedic trauma and surgical trauma which can be undertaken only after the MS course in orthopedics and general surgery respectively. Additionally neurosurgeons already have enough training in neurotrauma as a part of their curriculum. The ACEE-India recalls that infectious disease was initially notified as a broad specialty by the MCI but later was upgraded to a superspeciality. Currently, MD EM program is running in 20 medical colleges in the country. It has been observed that due to the absence of clearly defined curriculum in this specialty, the postgraduates are being rotated through larger part of their three year training program in the Critical Care Medicine units at the cost of teaching and training in the core discipline of EM. This is adversely affecting the growth of academic EM and the post graduates are not being adequately trained in the main department. Further, it may be noted that the training program in Critical Care Medicine is in itself a superspeciality/post-doctoral training program; hence it is likely to create confusion with the personnel being trained in this superspeciality. Hence the ACEE-India recommends that the students undergoing MD course in EM should spend larger part of their training in the department of EM as per the proposed rotation schedule stated in [Table 6]. MCI has recognized DM course in Critical Care Medicine as a superspeciality. Post graduates with MD in EM should be eligible to pursue super specialty courses in Critical Care Medicine. 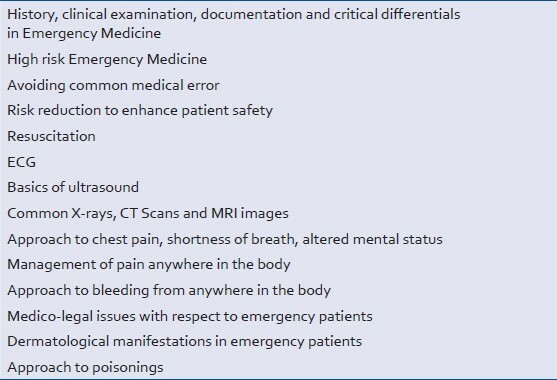 This is suggested keeping in mind that critical care begins in the Department of EM and the training as an emergency physician lays strong foundation to pursue DM course in Critical Care Medicine. These post graduates should also be eligible for super specilization (doctorate in medicine) in other disciplines. In addition, once the specialty of EM is fully established in India, superspeciality courses in pediatric EM, toxicology, disaster management, and tropical emergencies may be established. NBE has also approved Diplomate of National Board (DNB) in EM. NBE may include the guidelines suggested here to approve any hospital for DNB in EM. Since various hospitals running DNB program in EM do not have teaching program for MBBS, ACEE-India is of firm view that before allowing any hospital to start DNB in EM, NBE must ensure that the hospital has fully-staffed ED and has facilities of training DNB candidates in various broad specialties and superspecialties during their rotation postings. Every medical college should have a Department of EM staffed by full-time faculty. This will help in teaching and training of undergraduates and postgraduates, and will also provide efficient emergency care to patients. For assessing eligibility of a medical institution to start 3-year MD course in EM, MCI should appoint only those assessors who are working as MCI-recognized Professors/Additional Professors in MCI-recognized Departments of EM in various medical colleges. Similar guidelines should be followed by NBE. For starting a Department of EM, the hospital should have at least 20 beds exclusively earmarked for EM where initial resuscitation, management and observation of patients can be carried out. Initially, the teachers for department of EM should be selected from broad specialties of general medicine, general surgery, anesthesia, orthopedics, and pulmonary medicine, if a candidate with MD in EM is not available. This may be reviewed later, once adequate number of trained emergency physicians becomes available. The MCI may drop the requirement of 2-year training in EM as the eligibility criteria for recruitment of teachers. In view of the shortage of teachers trained in EM, when the teachers are selected for the department of EM from other identified specialties, teachers with in-house experience/under-going a course or fellowship program in EM (like FACCE) may be considered for the initial period of 10 years. The Faculty must work only in the Department of EM on full time basis and should not continue to work part time in their parent departments. Department of EM should have adequate infrastructure and equipment for management of patients. Department of EM must not admit patients under its care. MCI and NBE should adopt a uniform core curriculum at the earliest so that the existing as well as future departments of EM have a clear direction for training of the postgraduates. The departments running EM program should have a proper rotational plan for the postgraduates so that they get exposure to all sorts of emergencies across all age-groups. The postgraduates should be given a list of procedural skills they need to acquire during the 3-year training program so that they become fully competent to perform life-saving procedures independently. Final theory examination should be based on short question-answers and not lengthy, essay type answers. The practical examination should not have any long cases. Only short cases should be given to the candidates. Procedural skills must be checked at the time of practical examination. Every MBBS student should be posted in the Department of EM as a part of clinical rotation. The MCI should reconsider its approval for the 3-year post graduate degree course (MS) in trauma and surgery and replace it with superspeciality courses in orthopedics and surgical trauma. The ACCE-India is at forefront in spearheading the specialty of EM in India. Even though MCI and NBE has recognized EM as a separate specialty, it has not grown at a pace which is desirable considering number of emergencies seen in our country. Further, training of these postgraduates is still not being done in a proper and scientific manner. Teachers Eligibility Qualifications for faculty selection in the department of EM as given by the MCI need some modification, particularly with regard to the requirement on 2-year experience in EM after obtaining postgraduate degree. Through this paper, ACEE-India wishes to optimize growth of departments of EM with emphasis on competency-based curriculum, so that fully trained competent emergency physicians are produced who can take care of all types of emergencies. 1. The World Health Report 1998. Life in the 21 st century: A vision for all. Geneva: World Health Organization, 1998. 2. World Health Statistics. World Health Organization 2010. Available from: http: //www.who.int/gho/publications/world_health_statistics/EN_WHS10_Full.pdf [Last accessed on 2014 Jul 11]. 3. Das AK, Gupta SB, Joshi SR, Aggarwal P, Murmu LR, Bhoi S, et al. White paper on academic emergency medicine in India: INDO-US Joint Working Group (JWG). J Assoc Physicians India 2008;56:789-98. 4. Pal R, Agarwal A, Galwankar S, Swaroop M, Stawicki SP, Rajaram L, et al. The 2014 Academic College of Emergency Experts in India's INDO-US Joint Working Group (JWG) White Paper on "Developing Trauma Sciences and Injury Care in India". Int J Crit Illn Inj Sci 2014;4:114-30. 6. Available from: http: //mciindia.org/InformationDesk/CollegesCoursesSearch.aspx?N=235 [Last accessed on 2014 Jun 21].